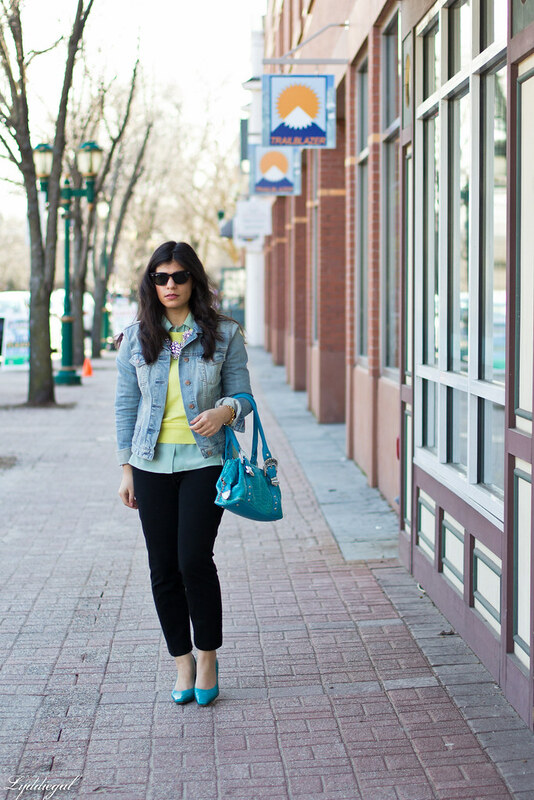 I've always been a lover of pastels, so layering them up seems like the perfect thing to do in the spring. As much as I keep telling myself to stop buying cheap costume jewelry from China, I fell victim to yet another super trendy piece. Last one, I promise! At least in an effort to make more room in my jewelry box, I ditched the regrettable bubble necklace, along with several other pieces. Hi. You cannot get any more beautiful I have decided. You always look like the definition of classy with some trendy mixed in but never too trendy. I adore that about you! I can understand completely. Sometimes . . . it happens. I love the yellow and mint today! Love combo, really nice the color of sweater. I can't blame you for snapping up that necklace; it's so pretty and versatile. I especially love the way you styled it - so casually chic. You are so stylish and beautiful! 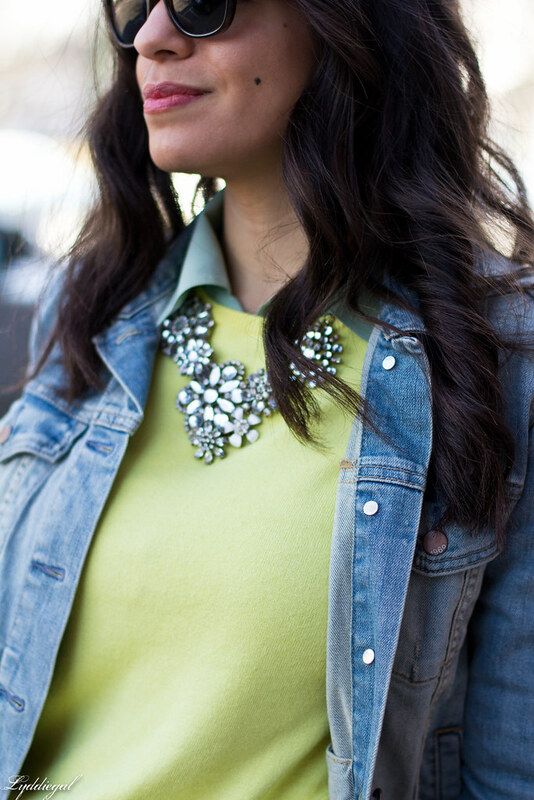 Gorgeous necklace and love the mint and yellow color combination, so pretty. I totally have the same necklace from ebay on its way to me! 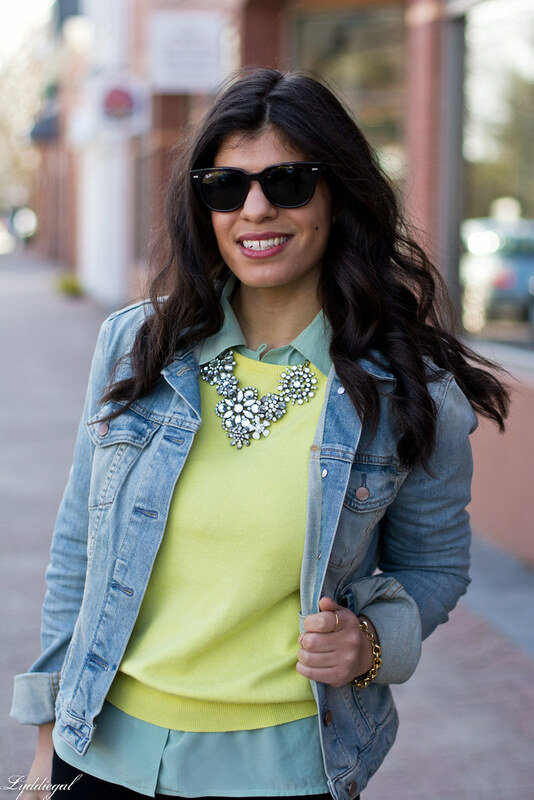 Love how you wore it with mint, turquoise, and yellow! How pretty! Love your pretty yellow top—and that gorgeous blue handbag!! Love this whole look--the layer is so great :) And I mean--who can pass up a great statement piece like that for a great price?! Certainly not me! Thank you so much for stopping by my blog! I love the colors in this outfit. I especially love your description, "who occasionally remembers to stay on budget". That is so me! Forgot to mention that I just followed you on Facebook. I hope you'll check out my page as well. I may very well copy this whole outfit for work later this week! Love! I would not have been able to say "no" to that necklace...even if the quality isn't the greatest. And I love this colour combo on you - it's just spring-y. That is a really pretty color combination Lydia! You know how to mix things girl. So pretty! Gorgeous necklace! Love this look! So cute, love the jacket! 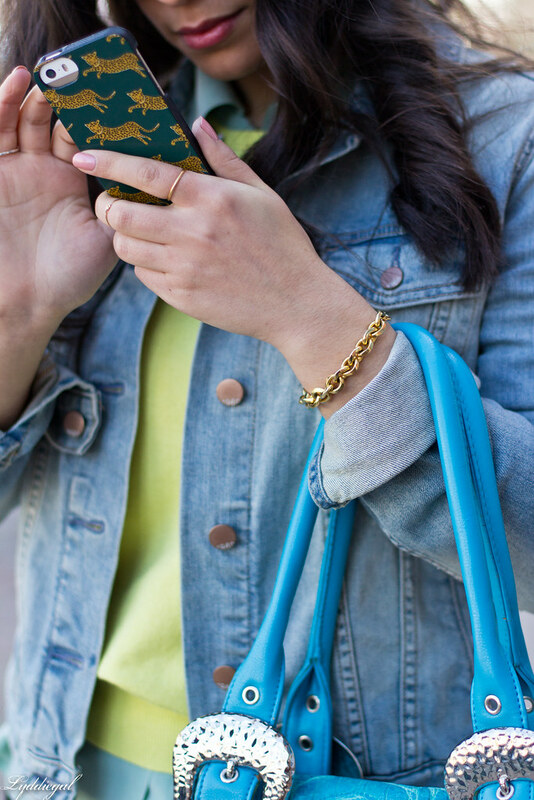 LOVE the combo of mint and yellow! Mint has to be one of my favorite colors. Love this look! And your phone case is too cute! You look amazing. I like your new costume necklace. I think the occasionally piece of costume jewelry from ebay is totally acceptable. I'm glad someone else has fallen victim to the China eBay knock-offs! I had to stop looking at eBay because I kept ordering. There are so many vendors now. That is a great piece though! I am not a fan of mint, but I love this outfit. It's so perfect for spring! Your layering is perfection! Such a great look for spring! Mint and yellow is such a great combo!! And I love that necklace. You look so fab! Love this color combo! Totally LOL on your comment about buying jewelry from China - I am so guilty! I tell myself to stop buying them but just can't help myself. I so had to pin this...perfection! Great mint yellow combo! never thought of that ! aww still looking great absolutely gorgeous! That necklaces looks so pretty with your sweater:) You look stunning. Kisses, lovely. Also, a happy late belated birthday to you. I'm glad you enjoyed some delicious cheesecake (chocolate coconut? you and I are one of the same, my friend) and received some nice pressies. What a great color combination! So polished yet fun! Gorgeous necklace - i would have fallen for it too . I adore the look and specially the incorporatin of the jean jacket.